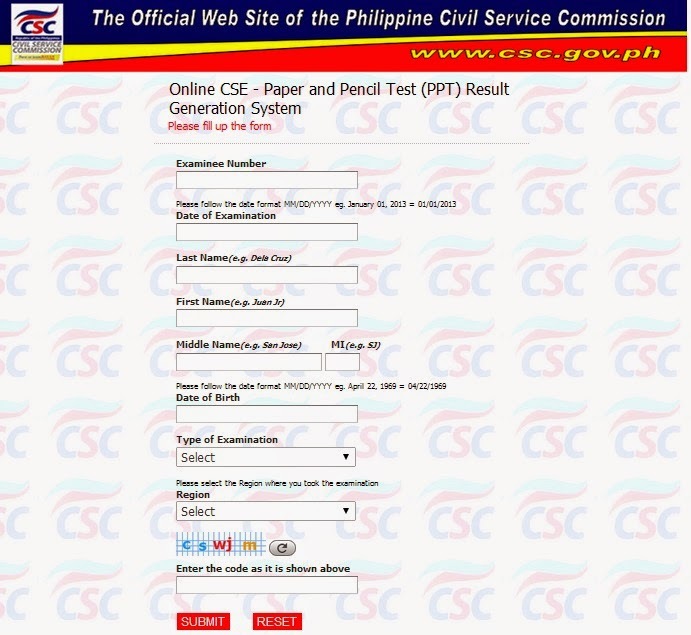 The complete results of the April 2014 Professional and Sub-professional tests of the Civil Service Examination were released by the Civil Service Commission on Monday, May 19, 2014. Takers of CSE-PPT are now asking how to get examination rating report. CSC said that passers of the the CSE-PPT exam must personally claim their Certificates of Eligibility at the CSC Regional Office/Field Office upon presentation of required documents. On the other hand, those who failed the examination may secure a copy of their Report of Rating through the CSC website. No Report of Rating shall be mailed to those who failed. To secure a copy of the Report of Rating, an examinee must key in his/her name, date of birth, examinee number, examination date, and examination type. Thus, examinees are advised to safe keep or remember their examinee number until receipt of the examination result.